Ha! Love it. My 23 month old went through a big dancing stage about 6 months ago and now he is too shy - he never dances. I miss it so much. 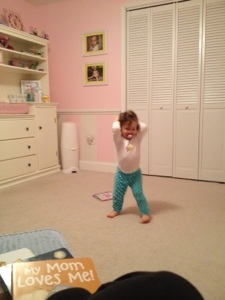 This is one of my daughter's signature moves too. She is precious! My 16 month old son is a dancing machine himself - it is always the highlight of my day!